At Verras Law, we serve as passionate advocates for our clients throughout the Tampa Bay area. We are committed to building client relationships and being readily available to respond to our clients’ questions and concerns, either at our main office in Palm Harbor or at our by-appointment offices in the Hyde Park neighborhood of South Tampa and in downtown St. Petersburg. By taking the time to understand our clients’ objectives, we are better able to develop comprehensive strategies that will enable them to achieve successful outcomes. 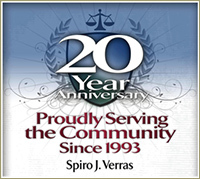 By leveraging the latest technological advances and Spiro J. Verras’ experience as a partner in a multistate law firm, we offer the sophistication of a large law firm and the personal attention of a small practice. If you need assistance with estate planning, probate and trust administration, elder law, guardianships, or any business transaction, call our office today at (727) 493-2900.